As we know from sales of The Tesla Disc Turbine interest in these wondrous machines is high, possibly helped by the fact they are pretty simple to make. While it does give some historical background, the main purpose of this book is to show you how to build your own Tesla turbine, in this case a fairly big machine having eighteen 3� diameter discs, and measuring 3 1/2� wide by 6� long x 4� high. This may not sound large, but these fascinating machines pack quite a wallop, Tesla himself aiming for �ten horsepower to the pound of weight.� As a guide to a straightforward and quick project, which results in something quite spectacular, this excellent book from Vince Gingery is hard to beat. 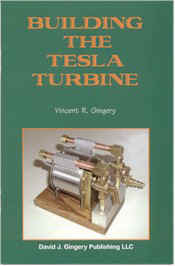 The purpose of this booklet is to show you how to build a Tesla Turbine. It is a fairly easy project consisting of a simple assembly of eighteen 2-3/4" diameter flat discs separated by washers and mounted on a shaft held between two high speed bearings and housed within a round cylinder. The turbine operates on the principle that all fluids have two prominent properties; adhesion and viscosity. To better understand the principle and what it means for our turbine, it is helpful to know that air, steam and the various gasses are classified as fluids just like water is. So when air or steam enters the turbine under pressure, the properties of adhesion and viscosity come into play and the rapid fluid motion essentially grabs the flat surface of the disks forcing them to rotate along with it as it moves ever rapidly to the center of the turbine. This force of movement on the flat disks in turn develops horsepower as well as very high r.p.m..
An overview of the turbine operation is as follows. . .
A pressurized jet of air enters the manifold as shown in figure 2 and makes its way through to the outer edges of the flat disk assembly where it is forced into the turbine by way of a nozzle. It follows a rapid spiral path around and around and as it does, it drags the disks along with it. Eventually, the air works its way to the center of Figure I. The turbine complete. the turbine and exits through the exhaust ports. The direction the turbine rotates is determined by valves located at either side. Looking at figure 2, note that if valve "A" is open and valve "B" is closed, the turbine will rotate clockwise. Likewise, if valve "B" is open and valve "A" is closed, the turbine will rotate counterclockwise. The turbine as detailed will rotate in excess of 5000 r.p.m. at a constant air pressure delivery of 80 pounds per square inch. Higher delivery pressures will increase the rpm. But be advised, when exposed to such high rotational speeds inertia stress becomes a concern. The turbine as detailed is constructed of type 304 stainless steel which is a stronger material than typical mild steel which does give it the ability to better withstand the stress of high speed rotation. Even so, care should be exercised, particularly at speeds in excess of 5000 rpm. As a precaution I would advise those who intend on operating this turbine, especially at higher speeds, to devise a safety guard and place it between the turbine and those in close proximity to it. The turbine project is well suited for those with miniature lathes. The largest turning requirement is the 3-3/16" diameter removable end cap. Besides a lathe, a drill press and/or milling machine and a bandsaw or hacksaw will be required. As can be expected with a project such as this, an assortment of hand tools will also be needed. Such tools as a pair of right hand (red handle) metal cutting snips, hacksaw or bandsaw, a small pipe wrench as well as an assortment of wrenches & screwdrivers as would commonly be found in the average workshop. A set of drill bits, a 4-40 tap, an 8-32 tap, a 118-27 N.P.T. tap, a 318-24 thread die and a .376 chucking reamer are also required. You will also need a 114" & a 112" collet to be used in the lathe for turning the rotor shaft. The turbine itself is constructed entirely of type 304 stainless steel. The rotor shaft is machined from 112" diameter s.s. round rod, the disks are cut from 20 gage s.s. sheet metal and the housing (stator) is cut to length from 3" diameter .065" wall s.s. pipe. The pressure line is assembled from an assortment of brass fittings and the end support brackets are made of brass as well. Though this project is meant to produce a demonstration model, it does have practical value. Similar turbines have been used to power generators for the purpose of producing electricity. Of course using air pressure from an air compressor would not be economical for such a purpose, but certainly steam pressure would be. However generating electricity and building steam boilers are subjects in them selves and beyond the scope of this book. There is plenty of room for experimentation and it is my hope this project is beneficial in that way. Remember to be safe. There are hazards lurking in all that we do. You will be working with metal and that includes cutting, forming, grinding and welding all of which pose an injury threat. Wear safety glasses, use common sense and consider each step and procedure carefully before you begin. Remember to safeguard all those who may be in close proximity to you as well. The turbine you are getting ready to build has the potential to develop very high rpm and that in itself poses some danger and you are advised to erect a safety guard between the turbine and those tending it and those who might be looking on as spectators. Ten horsepower to the pound of weight! Also included in this booklet are step by step instructions in the form of detailed photos and drawings showing how to construct your very own Tesla turbine. Not an exact replica of the original, but one that has been simplified, thus making it much easier to build than the original. The result is an impressive model measuring 3.5" wide x 6" long x 4" high. Although it comes in a small package this turbine generates impressive power. The model as detailed rotates at speeds in excess of 5000 r.p.m. at 80 p.s.i. of air pressure. And it has the capability of running either clockwise or counter-clockwise at these speeds. Because the turbine is capable of such rotational speeds, it has been constructed entirely of stainless steel which is a stronger material than mild steel. Building the turbine requires basic metal working ability including the cutting, grinding and shaping of metal. You will need a small lathe capable of turning at least a 3.25" diameter, a drill press and/or milling machine, a hacksaw or bandsaw and an assortment of hand tools including metal cutting snips, screwdrivers, wrenches etc. This is an amazing project and one you are sure to enjoy. But be careful. Once you start you won't be able to get enough of Tesla and his amazing inventions. The more you learn the more you will realize that Nikola Tesla was truly a genius light years ahead of his time.